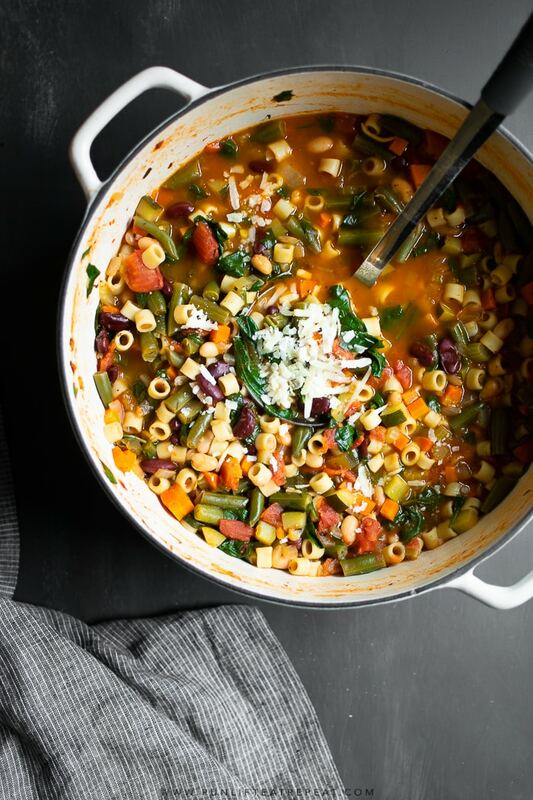 This minestrone soup is a favorite for obvious reasons. 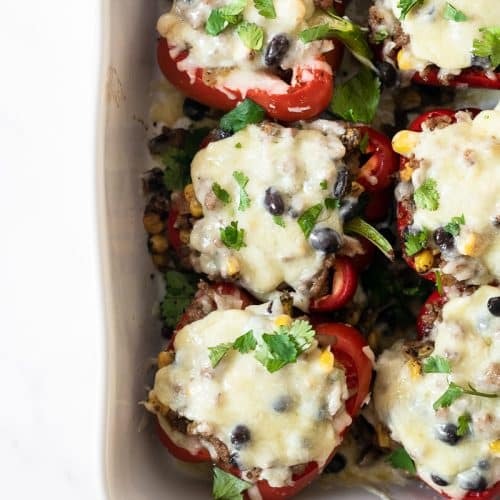 It’s hearty, filled with tons of vegetables, and packed with flavor. It’s the soup recipe that you’ll make again and again! I made this recipe a few weeks ago to use up those on-the-last-leg vegetables and threw it together. I then made it the other week when I feeling under the weather and I loved it even more. I mean, it’s vegetable soup. But it’s healthier, wholesome, and keeps me full and satisfied without feeling overly full. I made another huge batch to the other day to easily heat up on those colder days, especially served with a crispy, melty, gooey grilled cheese. The soup is pretty forgiving. Play around with the vegetables based on what you like or based on what needs to be used up. I normally use whatever beans I have sitting in the pantry — usually great northern beans, kidney beans, and chickpeas. No matter the bean, it works. 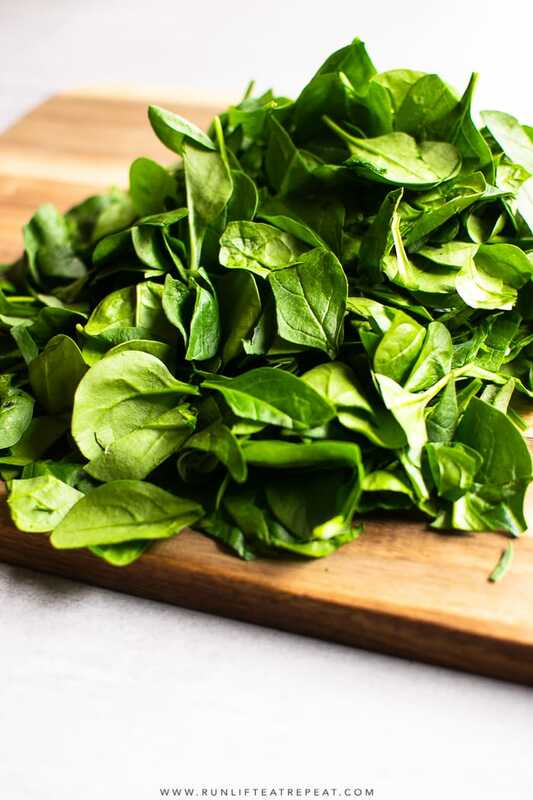 For the spinach, you can omit if you’re not a fan or use swiss chard or kale instead. 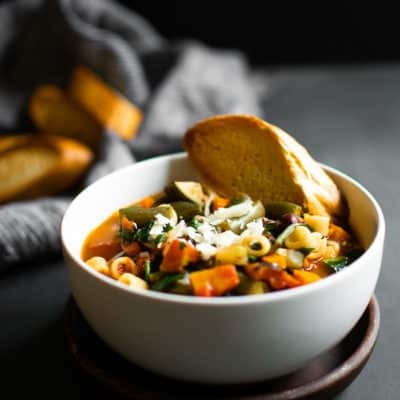 What Makes This Minestrone Soup My Favorite? 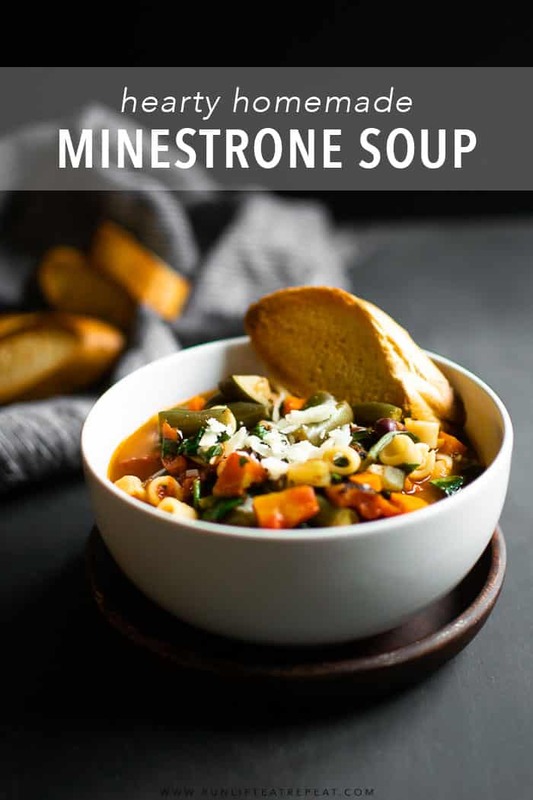 There are hundreds of minestrone soup recipes out there. But this minestrone soup takes me back to my childhood. It’s a bit heartier and less brothy than the traditional which is why I love it so much. The pasta (or rice) helps soak up some of the liquid which then naturally thickens it up. I toss in a ton of fresh vegetables: zucchini, carrots, celery, green beans, spinach and tons of canned beans. And the flavor is out of this world. From the tomato paste to the onion to the tomatoes to the spices. There’s so much color, flavor and texture packed in, how could this not be a favorite?! 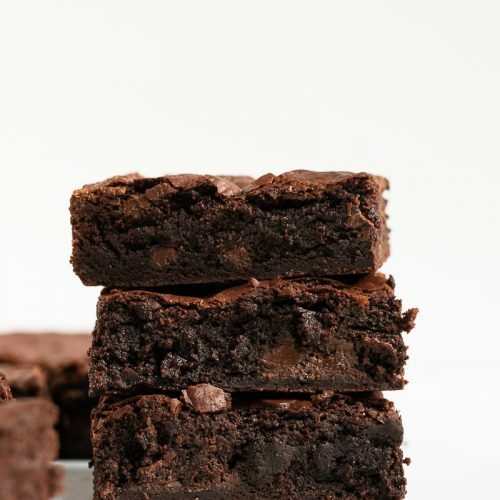 I can’t believe it took me so long to share this recipe! After sharing a quick photo of it on Instagram last week, I got so many questions about it. This soup was gobbled up quicker than any other dinner that I’ve made in a really long time. And the recipe makes enough for a large family. For this family of 2, there’s tons of leftovers. We’re talking daysss worth of leftovers. I’m OK with that. 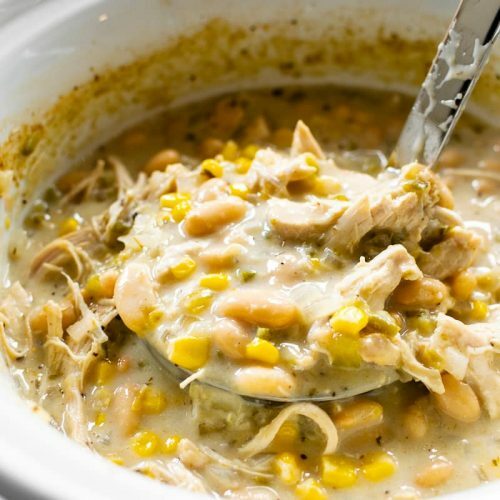 It’s Slow Cooker Friendly Too! 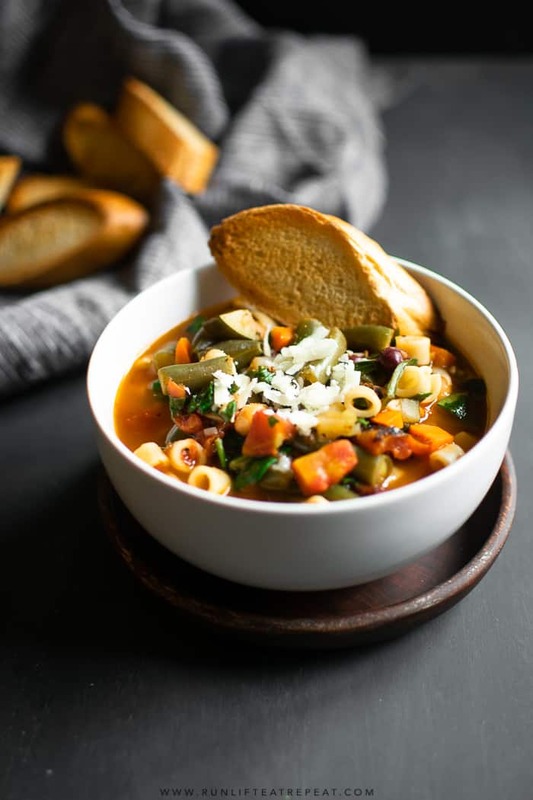 If you don’t even want to bother with the stove, make the minestrone in the slow cooker! These directions are also in the recipe below for easy reference. Simply add all the ingredients to the slow cooker, except the pasta (or rice), spinach, and lemon juice. Cook on low for 3 hours, then add the pasta (or rice) and spinach. Cook on low for 1 more hour. Squeeze in the fresh lemon juice and give it a big stir. That’s it! 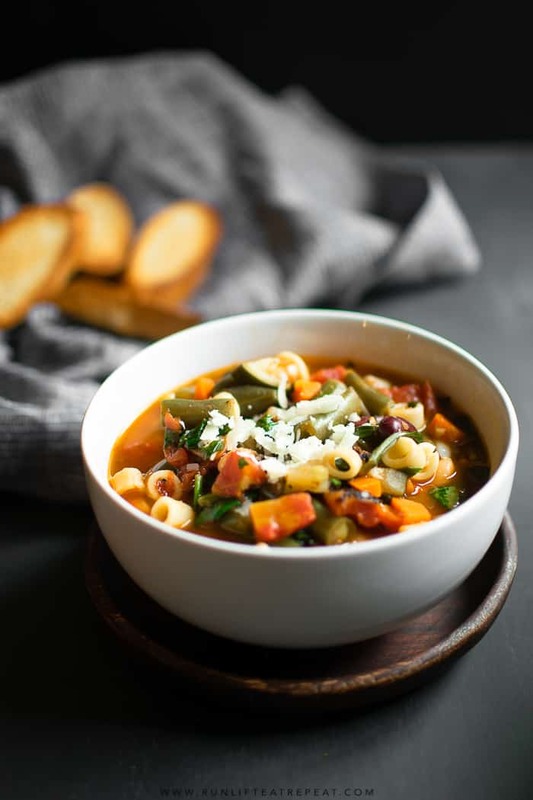 This minestrone soup is a favorite for obvious reasons. It's hearty, filled with tons of vegetables, and packed with flavor. It's the soup recipe that you'll make again and again! Heat the olive oil over medium-high heat in a large (5-quart or larger) pot or dutch oven (here's the one I own and love!) Add the onion, carrots, celery, zucchini, garlic, Italian seasoning, salt, and pepper. Stir and cook for 5 minutes to allow the vegetables to soften. Add the tomato paste and cook for 1-2 minutes. Add the broth, water, bay leaves, all the beans, and diced tomatoes. Stir together. Bring to a boil, then add the uncooked pasta. Reduce the head to medium, cover and summer for 10-12 minutes or until the pasta is cooked. Stir in the chopped spinach and lemon juice. Simmer for 2-3 more minutes. Remove both bay leaves. Serve soup warm and top with fresh parmesan cheese, if desired. 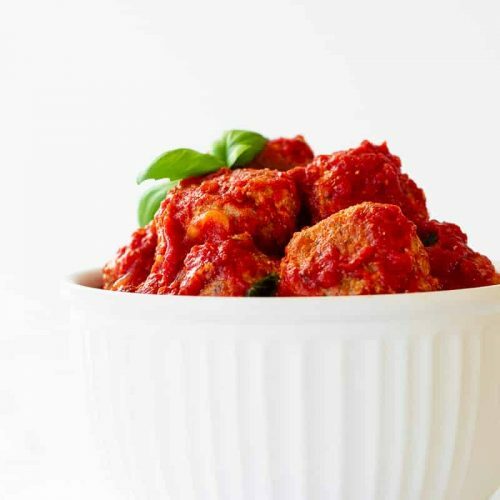 Store leftovers in an airtight container in the refrigerator for up to 1 week. To reheat, pour into a pot over medium heat and cook until warm. Likewise, it can also be heated in the microwave. Feel free to add more broth or water if it's too thick— I usually do. The pasta tends to soak up the broth. Make ahead tip: The soup freezes well. Freeze for up to 3 minutes. Thaw in the refrigerator the day before, then reheat as desired. Slow cooker directions: Add all the ingredients to the slow cooker, except the pasta or rice, spinach, and lemon juice. Cook on low for 3 hours, then add the pasta or rice, spinach, and lemon juice. Cook on low for 1 more hour. Add the lemon juice and give it a quick stir. 1If you don't have Italian seasoning on hand, you can use equal combination of dried basil, oregano, parsley, etc. totaling 1.5 Tablespoons. 2Use your favorite combination of beans. I've used chick peas in this recipe as well! 3Any type of pasta or rice works, but just make sure it's smaller in shape. Try my lightened-up creamy chicken noodle soup next! Previous Post: « 20 Holiday Gifts for the Fitness Enthusiast In Your Life.